To use the shortcode builder interface, you will need to have the Williams Shortcode Builder plugin activated, and be using the visual editor. 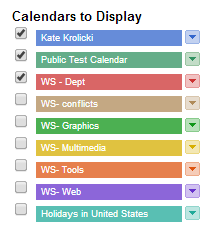 Place your cursor in the visual editor where you’d like the Google map/calendar/document to appear. 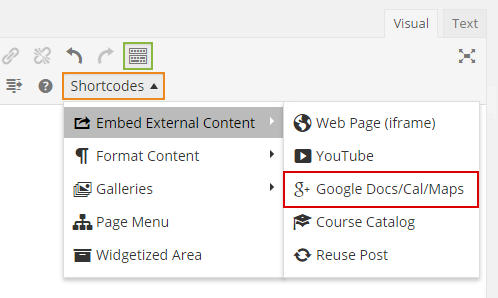 Click on the “Shortcodes” button, located in the 2nd row of your visual editor’s toolbar (outlined in orange below). If you only see 1 row of tools, click on the kitchen sink (outlined in green below) to reveal the 2nd row. 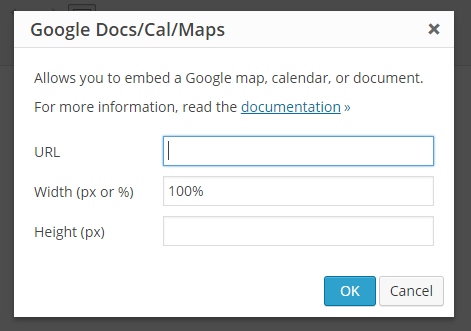 Hover over the “Embed External Content” menu to reveal its submenu, and select “Google Docs/Cal/Maps”, outlined in red below. Fill out the form in the dialog popup box, shown below. Hovering over the input boxes will reveal hints, helping you fill out the form. Clicking “OK” will insert the shortcode into the visual editor. See the Getting a Google URL section for more details on how to the the correct URL for each type of Google application. You can edit the shortcode attributes (the values inside the quotes above) directly, or you can delete the shortcode, and create a new one using the shortcode builder tool again. Expand the sections below for directions on getting the correct URL to use in the popup window. Generate the map you want at maps.google.com. While viewing the map you just made, click on the gear icon on the bottom right of your screen (shown to the right outlined in red). 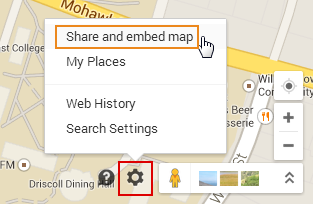 Select "Share and embed map", which will launch a popup window. In the popup window, click on "Embed map" (shown outlined in red below). Copy and paste the iframe info (outlined in orange above) into a text editor of your choice. We only want the iframe src URL, and need to get rid of the surrounding HTML. Strip out everything but the URL. Copy & paste this URL into the shortcode builder popup. Go to Google calendar and log in with your Google user ID. Under "My calendars" (see red arrow below), locate the calendar you'd like to embed, and the click on the down arrow next to its name (outlined in red) to reveal an options menu. 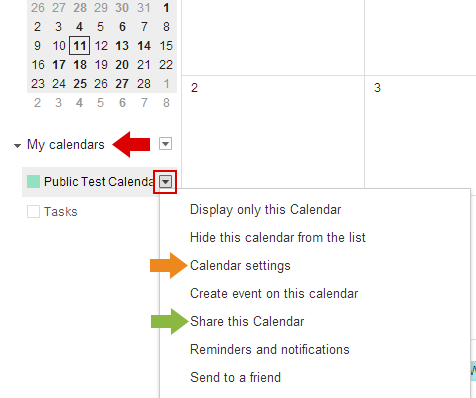 Select "Share this Calendar" (green arrow above) and check off the "Make this calendar public" box. Copy the iframe src URL (highlighted in purple above) to use in the Shortcode Builder popup. In the lower left, find your list of calendars. Check off the calendars you want to include in this composite calendar. In the upper left, provide a title for the composite calendar. Customize additional options displayed below the title as desired. In the upper right, click the "Update HTML" button and select the iframe src URL (only the part outlined in red below) to paste into the shortcode builder. To create a signup sheet, click & drag to select a time range on your calendar, which will pop up the event creation dialog. 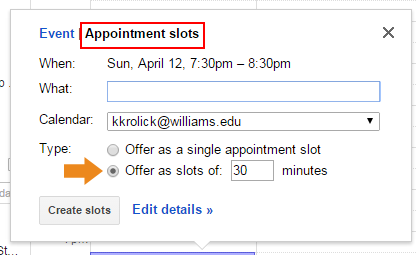 Click on the "Appointment slots" link outlined in red below. Set the length of the time slots under "Type" (orange arrow below). Go to Google drive and log in with your Google user ID. Edit the document you'd like to embed. 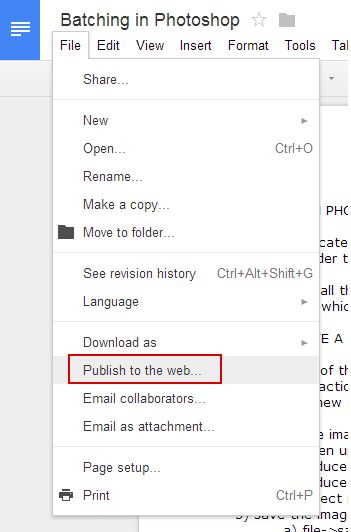 Select File -> Publish to the web (outlined in red to the left). 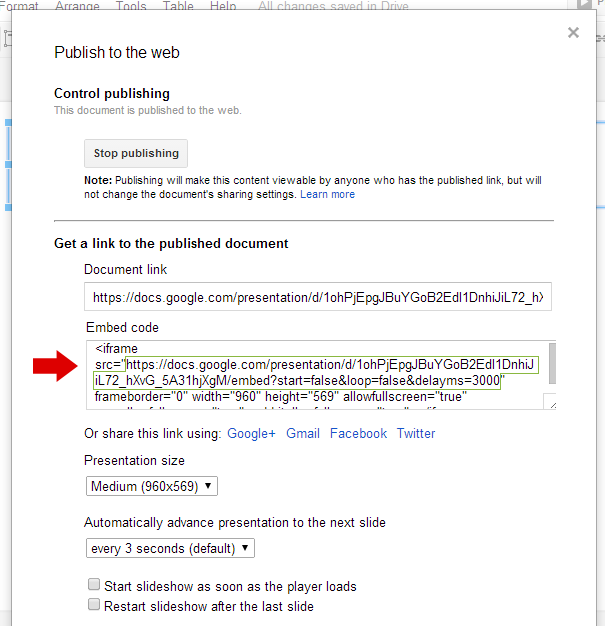 If you publish a Google document to the web, it will be public regardless of what share settings you select for the document. 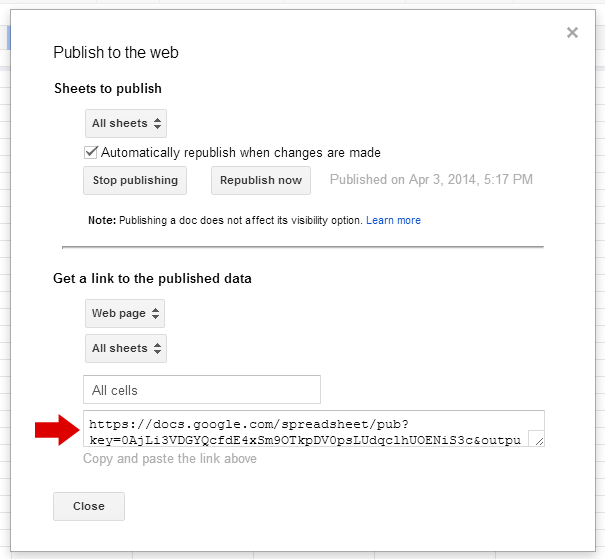 The exact details of getting the URL depend on which type of Google Doc you're using. Select the appropriate tab below for more information. Click the "Start publishing" button. 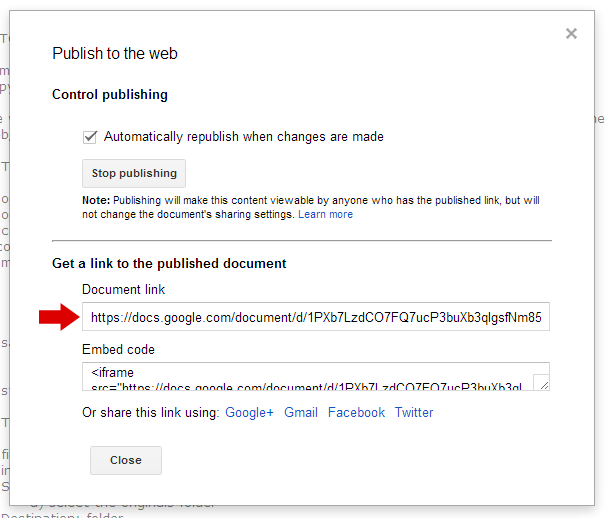 Copy the document link in the popup window (red arrow below) to paste into the Shortcode Builder. Copy the URL at the bottom of the popup window (red arrow below) to paste into the Shortcode Builder. Find the embed code in the popup window (red arrow below). Copy just the iframe src URL (only the part outlined in green) to paste into the Shortcode Builder. To embed a Google form, go to Google drive and log in with your Google user ID. Go to the edit form screen of the desired form, and click on the more actions -> embed option at the top right of your screen (see below). You'll want to copy ONLY the iframe src URL (https://spreadsheets.google.com/spreadsheet/embeddedform?formkey=dEVvbEpzbVFKME44R1RVRi1aWVFuVWc6MQ in the example above), and paste it into the Shortcode Builder. The forms tend to be tall, so make sure you give it plenty of height so you don't cut off your submit button.